Mandy Hickson is a former Royal Air Force pilot and Human Factors facilitator. She was the only female pilot on her Front Line Tornado Squadron, flying multimillion pound fast jets. She has also operated in hostile environments, including patrolling the ‘No Fly’ zone over Iraq. Carrying the latest weaponry, along with her unit, she was ready to drop ordnance on any target in support of operations. Mandy Hickson’s route to the top was turbulent; at 17 she was awarded a RAF flying scholarship, long before she even passed her driving test. However, despite her achievements, she failed the computer based tests required by the RAF. 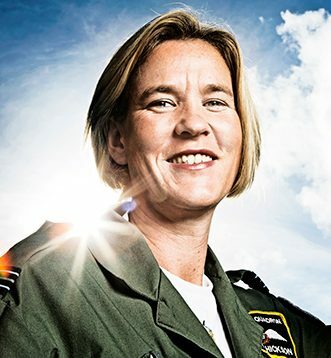 Undeterred, driven by determination and passion, Mandy Hickson persuaded the RAF to take her on as a test case, thereby overcoming seemingly undefeatable hurdles. Mandy Hickson relays her experiences of working with an elite team of fast jet operators with command and clarity, outlining the many ways in which the same values can be applied within any environment. Notably, she demonstrates the importance of remaining calm under pressure and leading from the front, to get the best from herself and her team. Mandy Hickson is a trained Human Factors Facilitator, making her an expert on interactions among humans. This affords her a detailed understanding of the role of human beings in complex systems. As a result, she applies this expertise, as well as personal experiences of calculating risk and making decisions under pressure, to businesses. Recently, she founded Inspiring Women for Work, which involves tailor made events designed to help women realise their full potential and regain confidence to return to work. To book Mandy Hickson as a speaker at your event please contact us here.